“Morioka Taxi Corporation” is a professional taxi service provider in Morioka, the capital city of Iwate Prefecture. Since 1924, we offer good transport service around Morioka, Hanamaki, Kitakami, Takizawa cities. The chartered taxi service is most suitable for business and sightseeing. You could use the same taxi and leave the luggage in the car. You can customize your own course as you like. ↓We have more model courses, to Hiraizumi, Hanamaki, Koiwai Farm, and so on. Highway tolls and parking fees will be charged separately. The time during your shopping and your meals will be calculated as the sightseeing hours. According to the schedule of the tourist Facilities, the course will be changed in some special situation.Thank you for your understanding. 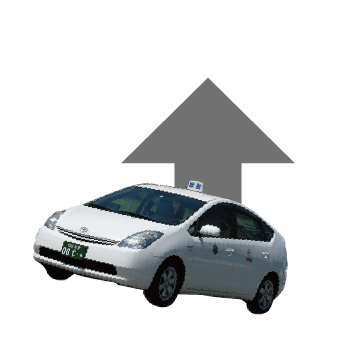 Distance-based Fares standard taxi 520 yen up to 1km, thereafter 80 yen for per 275m. bigger taxi[9 seater] 660 yen up to 1km, thereafter 100 yen for per 215m. Time/Distance-based Fares standard taxi 80yen for per 100 seconds at a speed of 10km or less. bigger taxi[9 seater] 100 yen for per 80 seconds at a speed of 10km or less. We accept cash(Japanese yen), and credit card(VISA, American Express, Diners Club International, JCB, Master card, DC, UC), and taxi ticket. Copyright © 2017 Morioka Taxi Corporation All Rights Reserved.